I spent a lot of the weekend cleaning up my studio! 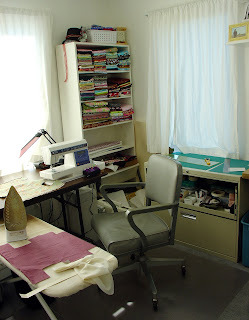 My studio isn't really pretty but it is practical - especially now that it is tidy! I'm quite pleased that my fabric has remained tamed and my notions are still neatly tucked into their drawer. He used two different kinds of wood to create the diamond pattern. I have no idea how he drilled the holes for the spool dowels. This rack was my Christmas present the same year I surprised him with a hand-knitted sweater. He still has the sweater but my spool rack gets more use! My cleaning frenzy coincided nicely with the advent of LittleputBook's new flickr group, Studio Shot Tuesdays. Go check out some other work spaces! 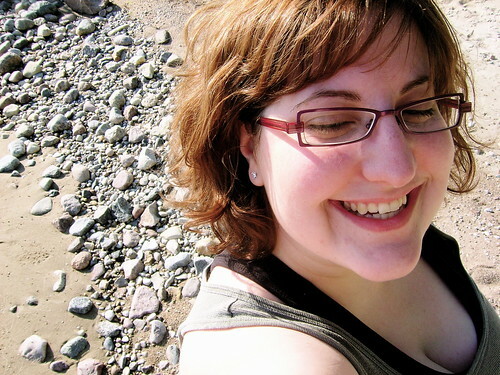 I've tagged you as a "Rockin' Girl Blogger!" I read a lot and am terrible about commenting, but just wanted to give you some support! Love your blog! 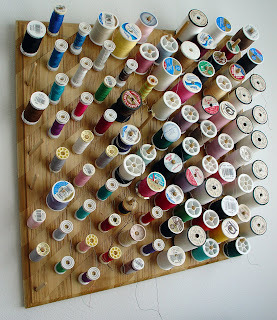 I think I would spend all my time rearranging things on the spool rack, just for fun. the spool rack the coolest!